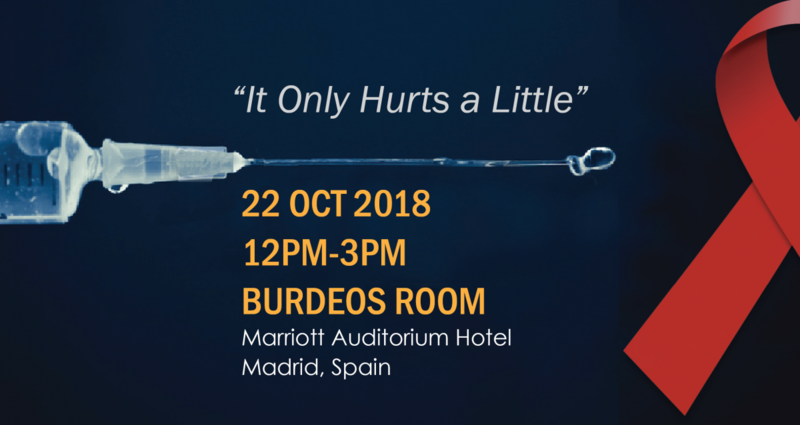 We held our pre-conference satellite session, “It Only Hurts a Little: Long-Acting Injectables for HIV Prevention and Treatment,” at the HIV Research For Prevention (HIVR4P) Conference in Madrid, Spain on Monday, October 22, 2018. With a full house, we had great conversations on both of our moderated panels discussing the clinical, behavioral, policy, and community considerations associated with the implementation of long-acting injectable antiretrovirals for both HIV prevention and treatment. We, at the Center for HIV Identification, Prevention, and Treatment Services (CHIPTS), were thrilled to hold this satellite session in collaboration with the HIV Prevention Trials Network, AIDS Clinical Trials Group, and UCLA Center for AIDS Research. Photos from the event will be up soon so make sure to like our Facebook page or follow us on Twitter for the latest updates! To learn more about future events such as this one, make sure to subscribe to our listserv.